Previously, AT&T's lowest-cost data plan went for $15 per month, but you only got 200MB of data. The $30 per month for 3GB of data is up from $25 per month for 2GB of data. AT&T's tethering plan was previously $45 a month for 4GB of data. The changes were announced on an AT&T blog. Fortunately, if you’re an existing customer, you will be grandfathered into your old plan. You won’t have to change to the new data rate unless you want to. But be forewarned, you can’t switch back to your old data plan if you decide the new plan isn’t worth it. AT&T’s plans are comparatively cheaper than its rival, Verizon. Verizon’s cheapest plan is $30 for 2GB of data--1GB less than AT&T’s $30 plan. AT&T’s decision to offer an inexpensive data plan makes a lot of sense for the carrier. We’ve seen a number of low- and mid-tier smartphones come out on AT&T, like the Pantech Burst for example. AT&T introduced tiered pricing in June 2010 and ended its unlimited data option. The carrier endured a lot of backlash as the data caps seemed unrealistic. As phones get faster and network speeds get faster (AT&T is currently building its LTE 4G network), customers will demand more data for their phones. The increase in data allotment puts AT&T on the right track, but are its monthly prices still too high? 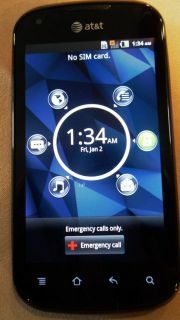 I got a quick look at the Pantech Burst shortly after it was announced at the AT&T Developer Summit keynote. The 4G LTE-capable Pantech Burst will cost $49 with a two-year contract; when bundled with the Pantech Element Honeycomb tablet the Burst will be free. The Burst will debut January 22 at AT&T stores. The Burst has a 4-inch Super AMOLED display, 16GB of on-board memory (expandable to 32GB), a dual-core 1.2GHz processor with 1080p video playback. The 5-megapixel camera can capture video in up to 720p resolution and there’s a VGA camera for video chat. And of course, you also get the benefit of AT&T’s fast LTE 4G speeds. All of this is pretty sweet at $50. Pantech has been making messaging-focused feature phones for AT&T and Verizon for quite some time, but moved into the Android space last year. The company is focused on affordability and offering phones to first-time smartphone owners. The Pantech Burst is the company’s best offer yet. While there’s an overlay on Android 2.3, it is pretty lightweight and unobtrusive. In my quick hands-on use, the Burst felt smooth and AT&T’s LTE speeds really shined when I used the browser. The camera seemed pretty solid as well, though it was a little harder to test in the oddly lit meeting room. Like the Pocket, you get seven home screens to customize with widgets or shortcuts to apps. At the bottom of every home screen is a navigation bar with shortcuts to the dialer, your SMS messages, the browser, and the apps menu. The Burst comes in two colors, red and titanium. Both are quite attractive, though I’m partial to the red. The battery cover has a “brushed” look, which makes the Burst look a bit more high-end. For many wireless users, Verizon's LTE service is no longer the only game in town. AT&T announced earlier today at an investor conference that it has launched 4G LTE mobile data service in 11 new cities, bringing its total LTE footprint up to 26 markets and 74 million customers, the carrier says. The new cities are the New York City metro area, Austin, Chapel Hill, Los Angeles, Oakland, Orlando, Phoenix, Raleigh, San Diego, San Francisco and San Jose. The service was already available in Athens, Ga.; Atlanta; Baltimore; Boston; Charlotte; Chicago; Dallas-Fort Worth; Houston; Indianapolis; Kansas City; Las Vegas; Oklahoma City; San Antonio; San Juan, Puerto Rico; and Washington, D.C.
AT&T has been marketing its 3G (HSPA+) service as "4G" but the new LTE (Long Term Evolution) service is the real deal. 4G LTE service delivers throughput speeds of up to ten times faster than 3G service. When an LTE subscriber moves out of an LTE coverage area, AT&T says, their device will automatically downshift to the slower 3G service. Verizon's LTE service works the same way, with it's subscribers downshifting to 3G CDMA service. AT&T says this LTE/HSPA+ combination is better than Verizon's LTE/CDMA offering because Verizon has not continued upgrading its 3G service as aggressively as AT&T has. "Customers of other carriers that have transitioned to 4G LTE without further speed upgrades to their existing networks are likely to see a jarring drop-off in speeds when they move out of LTE coverage," AT&T says in a release today.